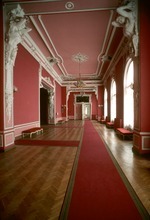 ﻿ Long red room with white molding and accents in Beloselsky-Belozersky Palace. Figural sculptures on ceiling trusses. Long red room with white molding and accents in Beloselsky-Belozersky Palace. Figural sculptures on ceiling trusses.